Discover the culture of Moroccan people and the landscape in which they have lived and defended their freedom, time and time again, over the centuries. The experience is often described as ‘stepping back in time’ from a modern world to one where the culture is rich with age old traditions and superstitions. Visit of the medieval town of Essaouira with its old port, the old medina and the landmarks. Essaouira Day Trip Morning departure around 8AM from your accommodation in Marrakech, towards Essaouira Mogador, one of the oldest coastal cities in Morocco. This trip will take three hours of travel. Arrival in Essaouira or the ancient Mogador, famous by its old harbor which was for many centuries an important trading point. The city settled very early by berbers and discovered by Phoenicians 5BC. Occupied by Portuguese in 15th century and which gave it the name of Mogador. During the drive we will stop to visit the argan forest and we will stop to visit a feminine cooperative producing Argan. This city has a typically Portuguese port mixed with Arabic art; which make the city worth a visit. 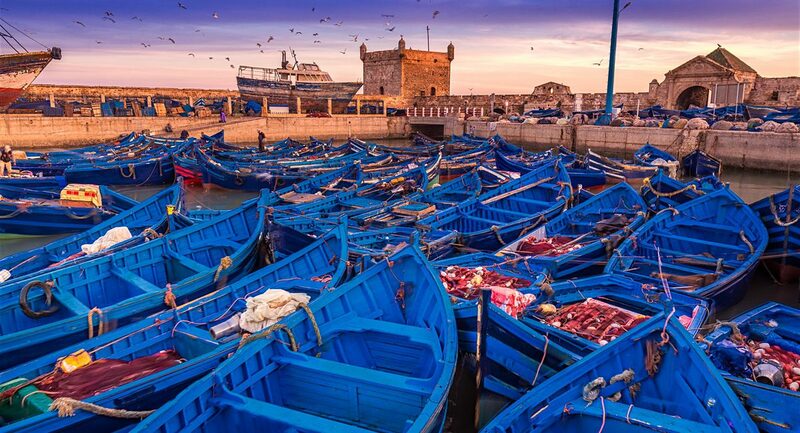 Once in Essaouira we will visit the old port and see the fishermen in their old boats, then, we will visit the sekkala the old Portuguese Kasbah, from there we will head to visit the old town Medina and the old jewish town. Then, stop for a fish lunch by the harbor or in a local restaurant. By the afternoon we will drive back to Marrakech. “End of Essaouira Mogador Day Trip from Marrakech”.